Dicen que el diablo está en los detalles y los bolsos son quizás esa pieza específica que mejor resiste el paso del tiempo e incluso el desgaste del cuerpo humano: mientras que gastarse 2,500 dólares en un vestido Saint Laurent con el que habrá que tener que extremar las medidas para no engordar, un bolso agradece la lealtad de su propietario por los siglos de los siglos o hasta que las nuevas tendencias les separen./ They say the devil is in the detail and bags are perhaps that specific piece that could resists the passage of time and even the aging of the human body: while spending $2,500 on a Saint Laurent dress while require to be extreme careful to not get fat, bags will appreciate the loyalty of its owner for centuries or until a new trend separate them. Mantener las hortalizas frescas no había sido una experiencia tan suntuosa hasta la aparición de esta bolsa de plástico transparente de Céline con valor de 590 dólares. Únicamente disponible en la sucursal de Nordstrom de Seattle y con unidades agotadas, ha puesto el sello de aprobación a otras prendas y accesorios con plástico lanzados por marcas como Anya Hindmarch, Chanel o Alexander Wang. Para algunos el reconocimiento de lo cotidiano como lujo y para otros una estafa que siendo sinceros, podría conseguirse de manera más asequible./ Keeping your veggies f resh had not been such a sumptuos experience until the appearance of this Céline transparent plastic bag with a value of $590. Only available at Nordstrom in Seattle and labeled and already sold-out, it has placed the seal of approval to other garments, accessories and bags made of plastic launched by many brands such as Anya Hindmarch, Chanel or Alexander Wang. For some people, the recognition of daily life as luxury and for others a scam that being honest, could be purchased for less money. Continuando con el intento de hacer de la compra una experiencia más atractiva, aparece la bolsa de red como argumento para presentar a los días cotidianos como el escenario más estético, y de paso, colar unos cuantos euros a la caja registradora. Instagram fue la incubadora de una tendencia que además ha vuelto a poner en el mapa otros accesorios y prendas vintage. 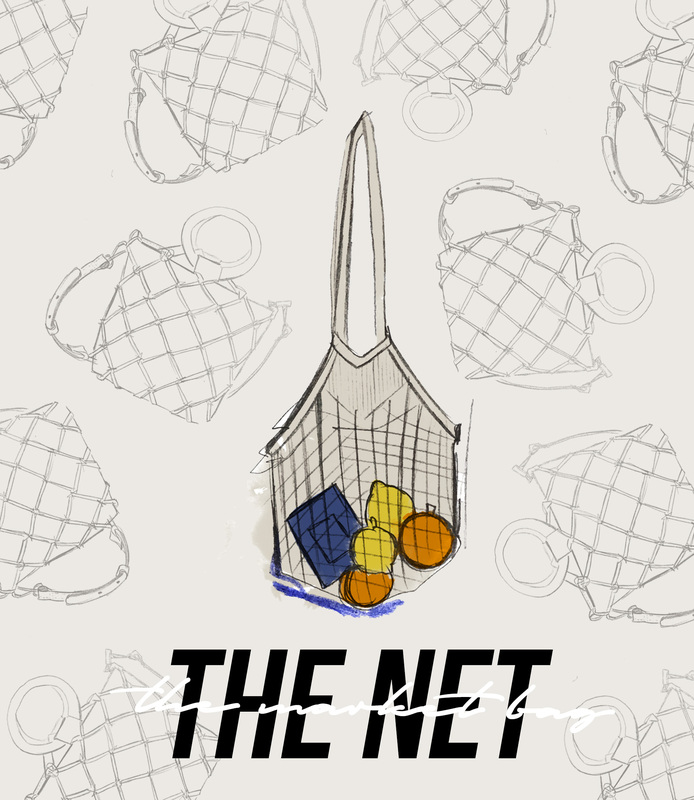 Mientras que nuestras abuelas utilizaban este tipo de bolsos para ir el mercado, ahora aparece en Instagram con productos de belleza y revistas en lugar de manzanas./ Continuing with the attempt to highlight the grocery shopping experience, the net bags appear as an argument to present the daily life as the most aesthetic scenario, adding a few euros to the cash register. Instagram was the incubator of a trend that has also put on the map other accessories and vintage clothing. While our grandmothers used this kind of bags to go to the market, it now appears on Instagram filled with beauty products and magazines instead of apples. *Según mi amiga Alethea de Dream Wild Freckles no se trata del accesorio más funcional, especialmente para objetos pequeños que pueden salirse por los agujeros./ *According to my friend Alethea from Dream Wild Freckles this bag is not the most functional accessory, especially for small objects that can get out of the bag through the holes. La nostalgia es uno de los recursos más eficaces que utilizan los diseñadores (no sólo de moda, sino de cualquier otra industria) para inducir nuestros impulsos a la compra con la premisa de volver a vivir un recuerdo único. En esta ocasión los bolsos con forma de animales nos remiten a nuestra infancia. ¿Ejemplos? El cocodrilo de mimbre (material estrella de la temporada) de Kate Spade, el adorable sabueso de Thom Browne o la fauna multicolor de Loewe. También en forma de llavero para los que quieran sacar al niño interno de una manera más recatada./ Nostalgia is one of the most effective resources that designers use (not only in fashion, but in any other industry) to induce our impulses to buy stuff with the premise of reliving a unique memory. 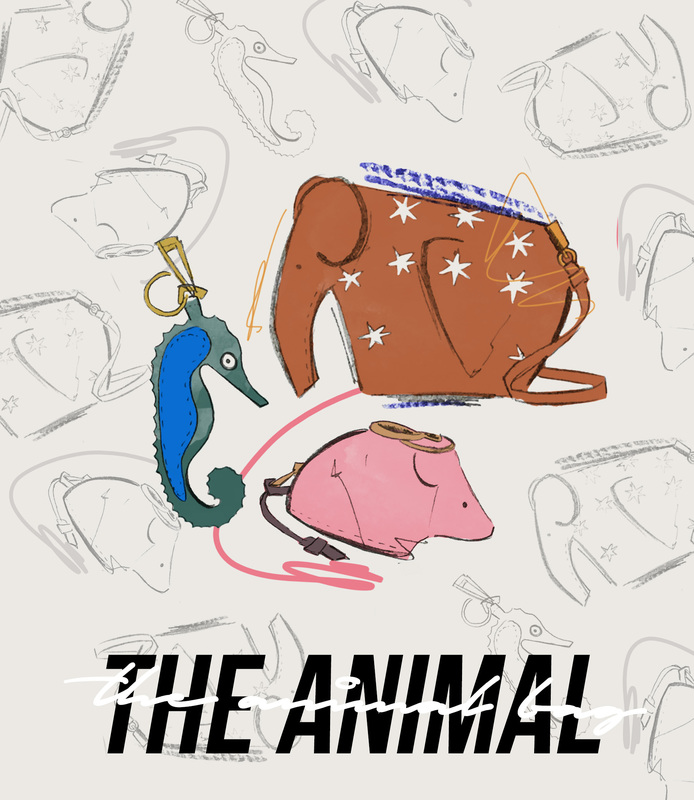 This time, animal shaped bags remind us of our childhood. Examples? A wicker crocodile by Kate Spade, an adorable hound by Thom Browne or the multicolored fauna bags and accessories by Loewe. Also available in the form of key rings and charms for those who want to wake up their inner child in a more modest way. La riñonera (cangurera) vivió su época dorada en la década de los 90, o al menos para mi generación fue el aliado perfecto para cualquier paseo escolar. Hoy no hay marca de moda que no haya creado su versión del bolso que algún día representó a los exploradores o a la cultura callejera, o que en algún momento sirvió de ayuda para los agricultores. 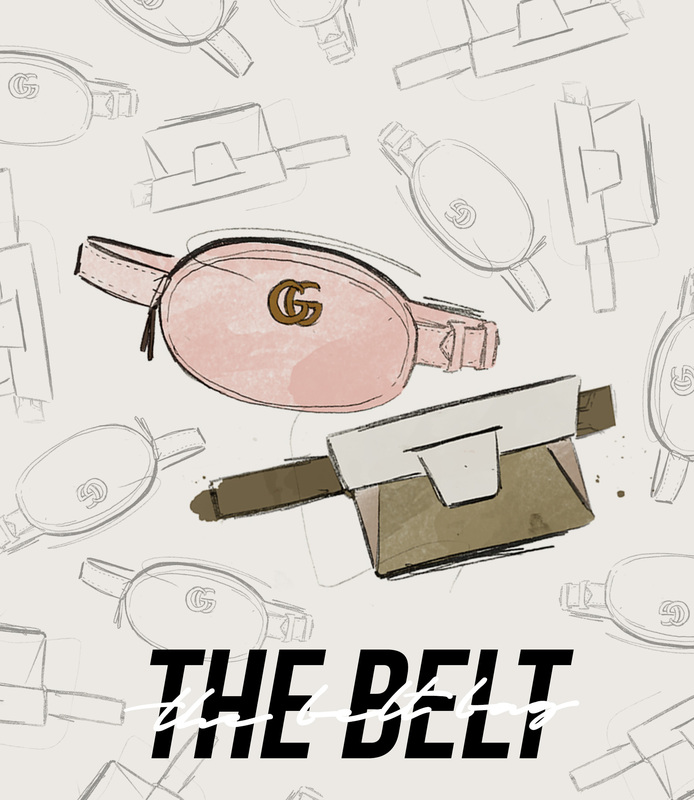 Ovaladas, de tamaño pequeño, deportiva, con colores llamativos o puramente minimalista, las opciones son infinitas./ The belt bags (the fanny bags) lived its golden age in the 90s, or at least for my generation it was the perfect ally for any school trip. Today there is no fashion brand that has not created its version of these bags that one day represented the boy scouts or the street culture, or an item that many years ago was the perfect work tool for farmers. Oval, small size, sporty, with striking colors or purely minimal, the options are endless. Actually I really love animals bags like the Kate Spade ones . I enjoyed reading your article and I love your drawings ! THANK YOU SO MUCH MIA! ❤️I would say animal bags are the pretties too, but as you said they are not as timeless as we wish, and if we take a look at the prices well…. we must think about this kind of stuff very well, more as an investment! Best and thanks always for your support! I’m absolutely in love with these illustrations. You’re so talented. 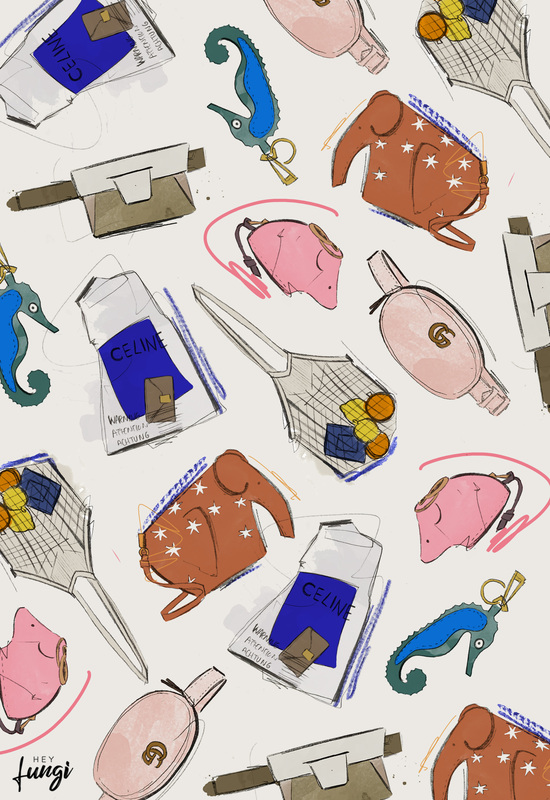 You’ve captured these bag trends perfectly. Such a great post! Very interesting to read and visually stunning as well. This spring accessories are often in the focus and bags are the perfect accessories for many. As you pointed out, we don’t have to worry about size when it comes to bags. Bags always fit! I must admit that I’m not enthusiastic about the net and plastic ban trend. I don’t see the point in designer bags made of the plastic! I mean if the design was truly original, sculptural or something like that, then I could get it. This way it seems like an easy way to make money for brands. It is almost like they’re making fun of their customers, saying: look, we can serve you everything and you’re just going to buy it, ha ha. As I said, I’m not impressed. Animal bags on the other hand, look really cute! So, I’ll be willing to jump on the wagon and follow this trend. Now, when it comes to fanny bags, I do get a little nostalgic. Plus, I’ve seen some really beautiful belt bags. I think fanny packs and belt bags can actually be elegant when the design is right. So, when this trend is in question, I’m all for! I love bags and love to find out new and original ones! My fav for this sieason are the belt bag and the animal bag! JAJAJAJA! Creo que yo sigo llevando el lunch en esa bolsita de plástico! Wish I have a bit of your talent! This is so great as this gives me more insight about fashionable bags. I find plastic bags really strange, somewhat funny, but really COOL! I’ve seen some celebrities and local designers in out country sporting it and they all look so bomb! What’s your favorite bag Pablo? Oooow thank you so much Tin! I still have a long way to go but practice makes perfect, they say! My favorite design is the elephant from Loewe, love how they managed to create such an interesting and funny piece of fashion with some folds! Hola Pablo! How are you? : I hope that you’re fine. First of all – congrats on such a good illustrations, Pablo, you’re real artist, dear. When it comes to bags, personally I’m addicted to this kind of accessory – you’re right – bags can «survive» more than 1 season, because even if you’ll get fat, you can wear the same bag, which you used to wear when you was skinny. Looking at bags of this season, I’m not really sure if I could find something to myself, which I could purchase in the high-street stores. I’m even more shocked that these bags aren’t functional nor even pretty – it seemed to me that I have déjà vu – I’ve seen everything something like this before, especially most of those bags, I reminded from my childhood as well (because I’m also 90’s kid). 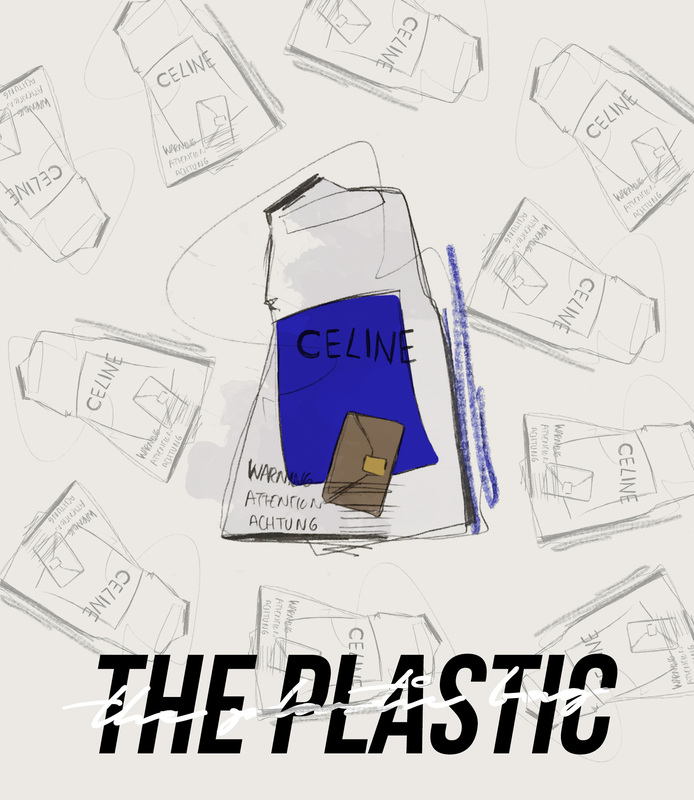 One more thing – that plastic bag from Celine for SUCH a lot of money – it sounds like madness! Hey Ivonne, I’m fine! Glad to see you back and thank you so much for your nice comment! And as you I think that 500 bucks for a plastic bag is a lot of money, especially cause you could find a very similar one for…. a 0,1% of the price? It is insane, but in my opinion it is also interesting to see how fashion industry works sometimes. El de la riñonera y el de los animales son los que más van conmigo. Los de animales me recuerdan a mis crazy bags que le dan un giro muy chulo a los looks y sin duda las riñonera, me permiten dejar las manos libres y no preocuparme de las cosas que llevo encima. Un abrazo querido. Sí! Las de animales son las que más me recuerdan a ti, Cata! While I don’t splash out on dresses I do like to invest in good handbags. They just last so much longer and as you said it does not matter if you gain a little bit of weight 🙂 As a photographer I am a big fan of fanny bags – it is great to have your hands free when you run around with a camera! Let’s say that now… we have bags of any type and taste!! Honestly, I still prefer the «normal» bags… but I couldn’t say no the LOEWE elephant bag!!! LOOVE! just stopping by to wish you a great weekend!!!!!!!!! ok these illustrations are toooo cute! omg i am in love! and this is the perfect roundup of this season’s hottest bags! Ohh my just reading this post makes me want to go bag shopping hahaha I don’t think I can fit another bag in my closet LOL! My current favorite are definitely the Celine and all the cool belt bags right now. How’s your spring so far? Talk to you soon!!! Happy weekend! Hey Radi! I’m glad you liked it! Let me know if you use one of this trends in the upcoming months! I just saw that you’re using some belt bag in your latest post! La verdad me volví una adicta de los bolsos mini y últimamente de las riñoneras que me han sido bastante cómodas, aún no se si me atreveré a la bolsa de red porque me da miedo perder el celular jajajaja. Honestly every time I revisit your blog I remember how madly in love I am with it. These illustrations are also all absolutely flawless, I would love to have a skill like that haha. And I completely agree with the point about how an expensive dress may cause you to have to try and fight to fit into it, a bag will stay with you for decades and doesn’t expect any sacrifice. I laughed at farmers and imagined the farmer wearing Gucci belt bag in the painting by Rubens. Fashion industry is crazy and lovely. I am worry to spend money, but I think I can control after reading your blog! Voy saliendo, pero prometo pasarme en cuanto vuelva! Este post merece ser leído con detención! Qué te puedo decir? Yo los quiero todos…. T – O – D- O -S!!!! Y es que como bien dices, un bolso es tan atemporal! Mi presupuesto dio para la net bag, el arc bag y ahora el de cuencas de plástico, ninguno de grandes marcas, hahaha! Es que si no a este paso, mi jubilación será más triste que un bolero, hehe!